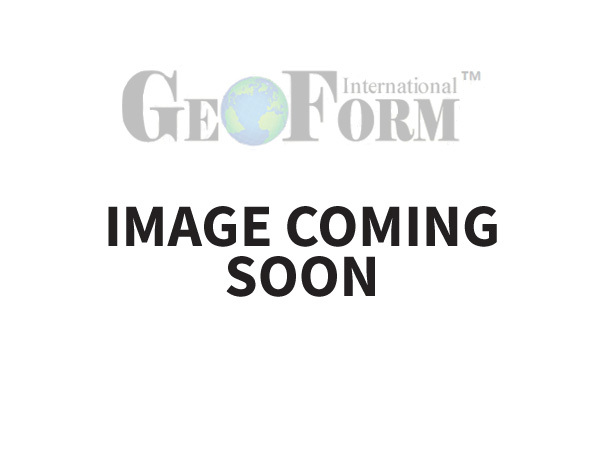 GeoForm International is a premier pump manufacturer for high-quality made in the USA submersible pumps. Our hydraulic pump line includes vertical pumps, slurry pumps, dredge pumps and wheel pumps. Our pumps power our world famous Dino6 and Dino8 Dredges, as well as our revolutionary aerators and sewage digester systems. 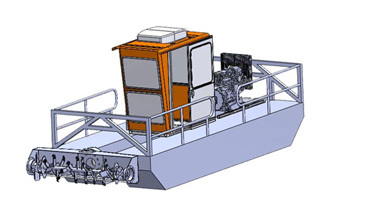 The Dino6, also known as the Dino Six dredge, is a uniquely portable dredge system developed to perform jobs inaccessible to other dredges and sediment removal equipment. The system is simple and easy to operate. 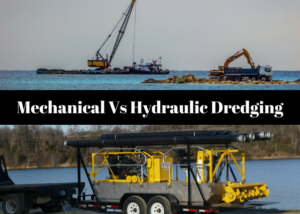 The sediment is excavated by a durable, high-torque, direct-drive cutter head and pumped at rates up to 1500 gpm through the highly abrasion-resistant, hydraulic submersible dredge pump. 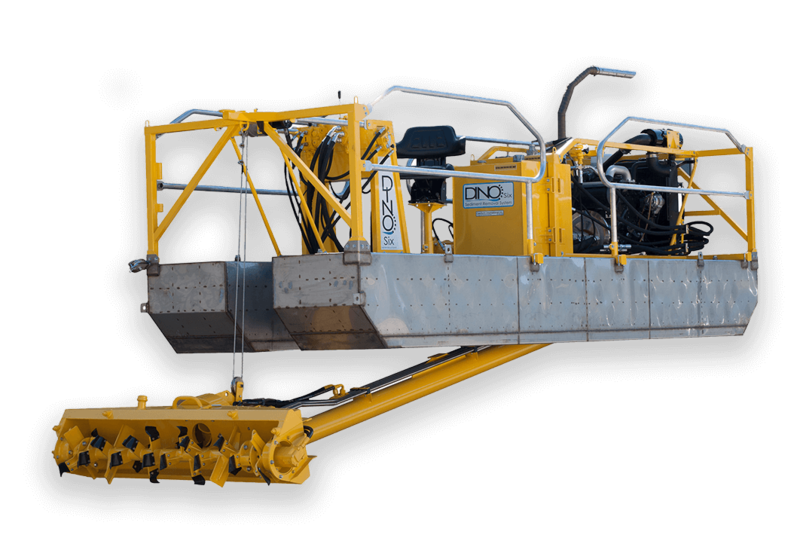 Although the Dino6 is lightweight, it is made of components and materials that are tougher and longer lasting than those of much heavier and more costly machines. 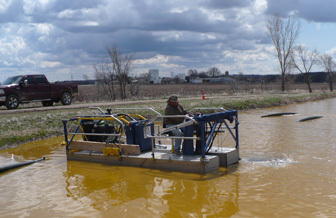 This powerful mini dredge is the small dredge you need for small-scale sediment removal projects. Born of our success in the world of small powerful dredges, comes the demand for something for those larger jobs. Designed with simple serviceable systems and components, along with proven Cummins diesel reliability and performance, the Dino8 can cut your time on the job in half. We are delivering to you, a system with 3000 gallon per minute capability, the ability to pump much further distances and the simple operation our customers have come to love. The phenomenal pumping capabilities of the 8″ Geoform hydraulic submersible slurry pump coupled with our commitment to simplicity, efficacy, and durability has created another powerhouse of a machine in a compact package. 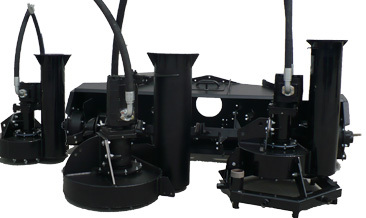 Our custom large scale aerator packages are unlike anything on the market. 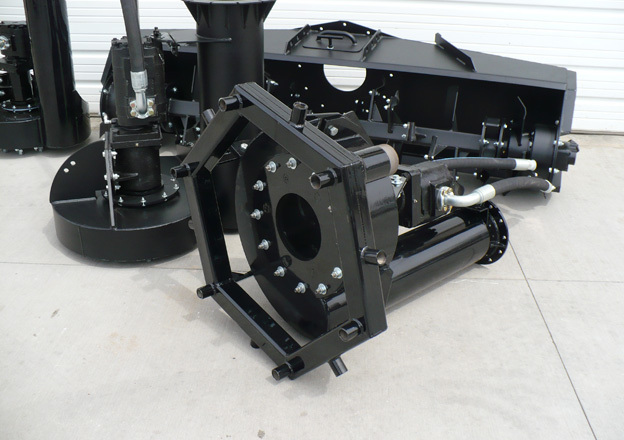 Our system employs a diesel hydraulic power unit or customer supplied PTO to power a submersible pump or wheel pump suspended or backed into a location, that feeds our riffle box. 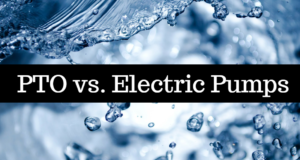 Two sizes of pumps are available providing the ability to process more than 50,000 or more than 150,000 gallons per hour. This system is able to be used as a stationary or portable solution to unique, seasonal, chronic, or emergency situations. Our vertical pumps are manufactured with the same expertise as our slurry and dredge pumps. They differ slightly in construction and purpose. These pumps are manufactured for use anywhere large quantities of fluid need to be moved. Available in a variety of sizes from 4″ to 14″ and produced to specific TDH requirements, to be extremely efficient during operation. Used anywhere large atmospheric centrifugal pumps and electric submersed pumps would be used inefficiently. Our digester packages feature all of the components needed to pump out the varied contents of a sewage digester. These systems are employed when, through broken equipment, rotten plumbing, or blockage a digester tank is unable to be emptied from the bottom. Our pump would be suspended and lowered to the bottom of the digester and when necessary, water would be added via a fire hose to wash more solids down from the walls to the pump. Supplied in either of two sizes, 100 or 130HP diesel hydraulic power unitsfeed 6″ or 8″ submersible pumps of our own construction. our pump packages come with all of the hardware required to suspend and plumb and pump straight to the truck or bag. This system is also effective for slurry stores. 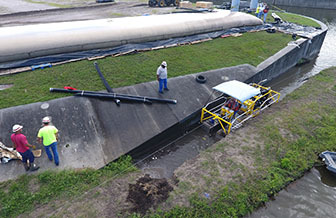 GeoForm International offers an assortment of high-quality, American-made sediment removal equipment including small dredges, submersible pumps, digestor packages, and aerators. 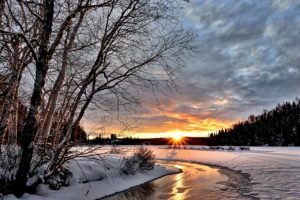 We serve a number of industries, which include pulp and paper, mining, community and stormwater management, wastewater management, homeowners associations, local municipalities, industrial manufacturing, chemical plants, and a number of others. 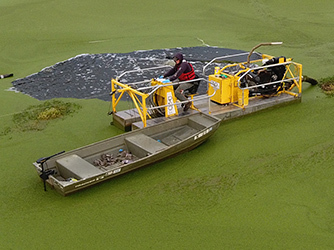 Our products are used for waterways, ponds, lakes, marinas, reservoirs, rivers, inlets, and lagoons. Contact the experts at GeoForm International to learn more about how our premium sediment removal equipment can benefit your industry. We’ll also be happy to provide you with information on our products to determine what best suits your needs. 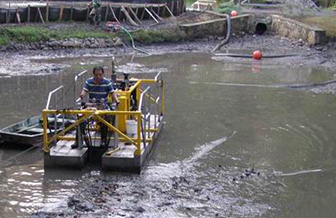 At GeoForm International, our team specializes in sediment removal equipment. 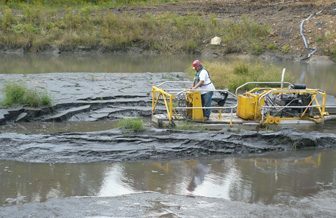 Our line of muck removal equipment is comprised of our Dino6 dredge, pond aeration systems, and submersible pumps. 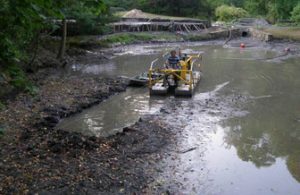 Muck and sludge removal are vital to keeping a healthy pond for wildlife and to keep the water from becoming stagnant or becoming infested with invasive vegetation. 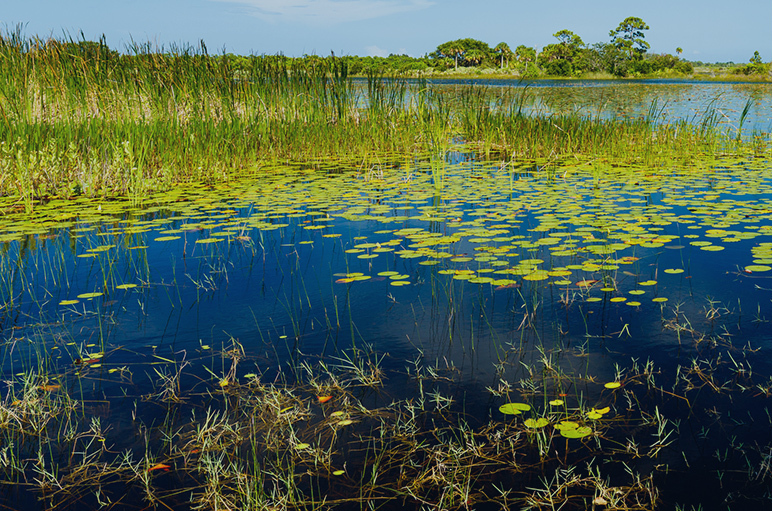 By decreasing the nitrogen-rich muck at the bottom of your pond, you can help it re-oxygenate. This helps to increase the clarity of your water, which allows more sunlight to the bottom. Dredging with the Dino6 can remove anywhere from 1’ – 13’ of muck and basin sediment from your pond and can go further with a boom extender. 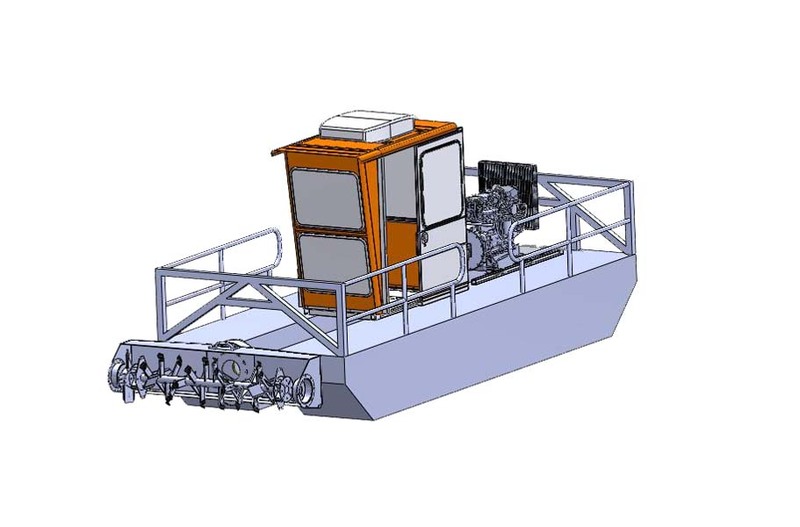 This versatile piece of equipment is small enough that it can be used in bodies of water that other dredging equipment cannot access. 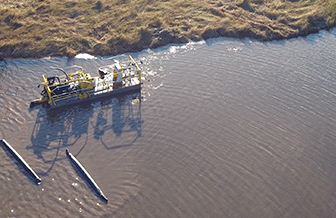 Dredging with our sediment removal equipment is a fast and effective solution to removing muck and widening bodies of water. Other methods of muck removal such as using muck removal pellets work at a much slower rate.